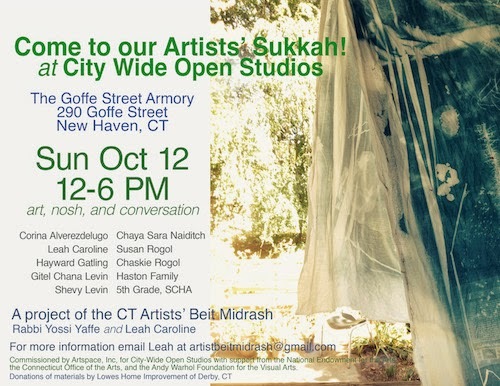 The Connecticut Artists' Beit Midrash is building a collaborative Artist’s Sukkah for New Haven's City Wide Open Studios (a sukkah is a temporary outdoor hut built for the Jewish holiday of Sukkot). It will be open for viewing during the Alternative Space Weekend. On Sunday, October 12 there will be nosh, crafts, and an opportunity to meet some of the artists. One of the themes of this sukkah is "transported nature," so feel free to bring any of your own plant cuttings to add to the sukkah. To prepare for this project, Artists met with Rabbi Yaffe of Chabad of the Shoreline to study texts related to the meaning of Sukkah; in particular how it helps us find comfort, light, and joy within transition, displacement, and the temporary. Among other themes and symbolism, the sukkah is like a birds nest--an outdoor impermanent structure that protects, shelters, nurtures etc. Most of the artwork will be cyanotype on cloth. 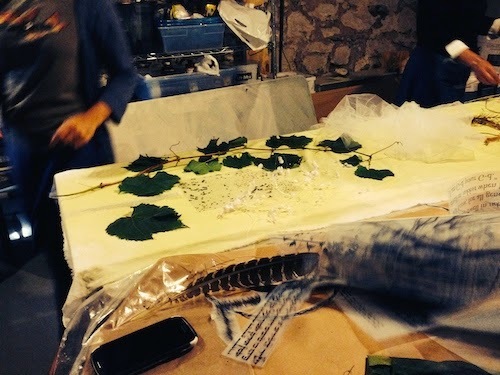 Leah Caroline, a local New Haven artist, gave cyanotype workshops with artists and young students to make the artwork for the sukkah. The sukkah and artworks are made by: Corina Alverezdelugo, Leah Caroline, Hayward Gatling, Gitel Chana Levin, Shevy Levin, Chaya Sara Naiditch, Susan Rogol, Chaskie Rogol, Haston Family, 5th Grade of SCHA. It is curated by Leah Caroline. Rabbi Yossi Yaffe, of Chabad of the Shoreline, met with the artists to study texts relating to Sukkah. Commissioned by Artspace, Inc, for City-Wide Open Studios with support from the National Endowment for the Arts, the Connecticut Office of the Arts, and the Andy Warhol Foundation for the Visual Arts. Materials donated by Lowes Home Improvement of Derby.